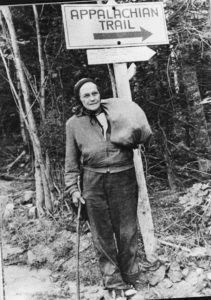 More than 60 years ago, in 1954, Emma Gatewood, a 66-year-old grandmother, equipped with sneakers, a blanket, and a plastic shower curtain, set out to hike the Appalachian Trail. She was unsuccessful. Her glasses broke, and she was forced to give up. One of 15 children born to a Civil War veteran on an Ohio farm, she went on to marry and have 11 children of her own. She also had a husband who beat her for 30 years, until she found the courage to divorce him. Gatewood’s conquest of the A.T. garnered a lot of publicity. Grandma Gatewood, as she became known, did not talk about her past. However, she did talk about the poor conditions on the trail. The stories she told, and the repairs that followed, inspired a new generation of hikers. She also walked 2,000 miles of the Oregon Trail, visited all 50 states, and left 24 grandchildren, 30 great-grandchildren, and one great-great-grandchild when she died at age 85.